Knowing which steaks are the most tender is key to choosing the most enjoyable cut since tenderness is arguably the most important factor in steak enjoyment. Of course, you will also have to weigh a number of other factors like cost and ease of cooking. Below is a look at the most tender steak cuts available with a little intel into why each is perfect for your plate. The tenderloin muscle is cylindrical with a narrow tip, somewhat like a pencil. It runs along the spine and is known for the buttery texture of its meat, hence the tender in the word tenderloin. The tenderloin muscle can be served in large chunks for chateaubriand or it can be sliced into steaks. The tenderloin includes the filet mignon, which is unquestionably the most delicate meat that the cow’s carcass has to offer. The meat from this cut is so tender that when it is cooked properly, you should be able to cut a tenderloin steak with a butter-knife. To maximize the tenderness, a tenderloin steak should not be cooked beyond medium rare; rare is ideal. Flat iron steaks come from the chuck and are a part of the animal’s shoulder. 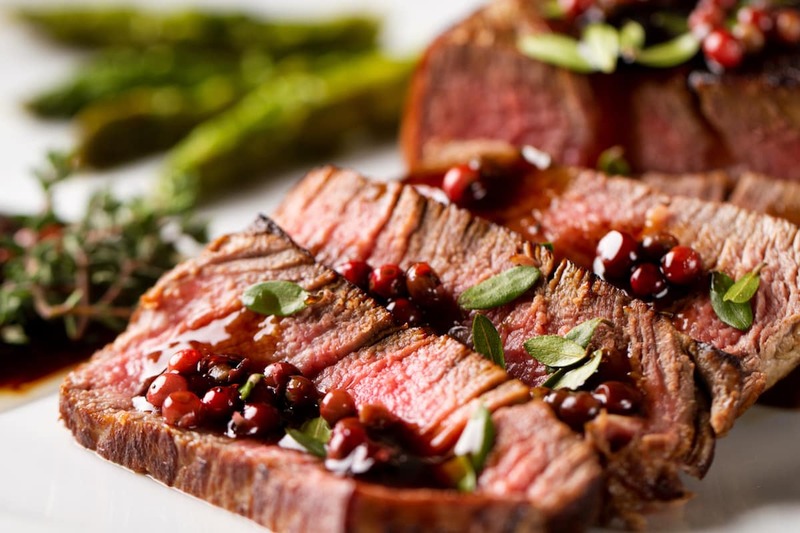 Normally the steaks from that part of the animal are relatively tough and contain a lot of connective tissue; however, flatiron steaks are cut so as to eliminate the gristle. By cutting it correctly, you get a steak that is considered second in tenderness only to the filet mignon part of the tenderloin and that is shaped somewhat like an old-fashioned clothes iron. Rare is the ideal degree of doneness for this cut of beef. Ribeye steaks are cut from the upper part of the rib cage. They come from the 6th through the 12th rib and are essentially the same thing as cutting down a prime rib into steak-sized portions. Ribeye steaks are a great compromise between the flavor of the chuck and the tenderness of the tenderloin in that they taste like the former but have a texture close to that of the latter. They tend to be well-marbled, which means that they stay juicy. Ribeye steaks can be grilled, but inexperienced cooks may be more successful cooking them in a cast iron pan. Rare is ideal, but ribeyes should not be cooked beyond medium rare. This steak comes from the short loin, which is located behind the ribs and it is usually sold boneless. The meat is fine-textured and may contain a little marbling on its edge, but there is usually not a lot in the meat itself; however, it can be well-marbled in some cows. Grade has a lot to do with this; this steak can vary between mediocre and excellent based on the grade of the beef. Good marbling will make it even more tender. This steak can be good at any level of doneness between rare and medium-rare if it is well-marbled. Porterhouse steaks come from the short loin and tenderloin area that lies just behind the cow’s upper ribs. The porterhouse steak has a T-bone, just like the T-bone steak. The T-bone is a part of the cow’s vertebrae and its shape comes the fact that it is a cross-section of the vertebrae. The T-bone separates a tenderloin steak from a top loin steak (New York Strip), which means that you are getting two of the most tender cuts of beef in one piece of meat. Of course, the fact that there are two different cuts makes it more difficult to cook each of them well but the right cooking methods will allow you to maximize this steak’s tenderness. Ideally, you should cook the New York strip side rare to medium-rare but keep the filet side as close to rare as possible.